A mum of two who had four jobs just to make ends meet “wept with joy” after moving into a smaller, eco-friendly home. 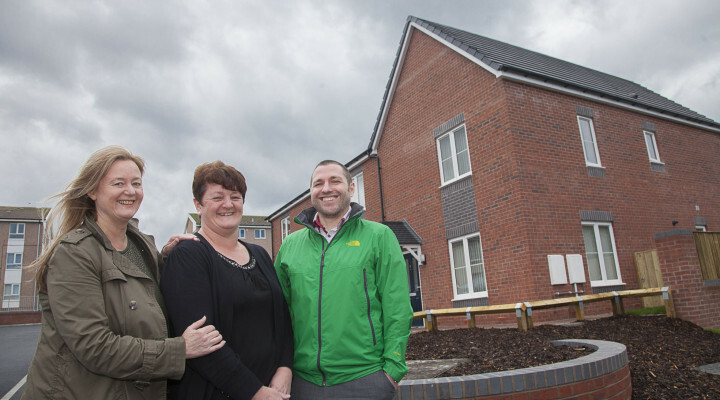 Sonya Pritchard is one of the first tenants of a £1 million development of nine homes built by housing association Cartrefi Conwy in Maesdu Road, Llandudno. The part-time cook has moved into a two-bedroom house from her old three-bedroom home in Jackson’s Court in Llandudno where she was in constant financial difficulty trying to pay the heating bill and the rent. Down-sizing to a smaller property came just in the nick of time for Sonya because she was facing an even worse nightmare from July when she was due to start paying the bedroom tax on her old home. The development was made possible because of a partnership between Cartrefi Conwy and Conwy County Borough Council who helped secure extra funding. As well as being highly insulated, the Llwyn Rhiannedd scheme has solar panels on the roof and rain water is collected in a tank to help flush the downstairs toilets. According to Cartrefi Conwy, the properties have been designed to be homes for life as well as enabling some tenants to downsize to more suitable homes. Sonya couldn’t believe her luck when she heard she had been allocated one of the brand new Llwyn Rhiannedd houses. She said: “I have two children, my son, Christian, who is 14, lives at home with me and is still in school. My daughter, Jade, 22, is studying to be a nurse at John Moores University in Liverpool. “She only came home during holidays but she graduates this year and will be looking for her own place. “I was always scratching around looking for money and borrowing to put money in the gas meter or put a bit of food on the table. “I never had a penny to my name and had to do whatever extra part-time jobs I could find just to make ends meet. “I can’t describe how ecstatic I am, just over the moon, all I’ve done is cry with happiness. This property is a band higher for council tax but I’m still massively better off. “Straight away I’m saving £30 to £40 a week on electricity and gas – and the rent is cheaper. And from July I would have been liable to bedroom tax and that would have been the final nail in the coffin to be honest. “I found it difficult when Jade reached 19 as I lost family allowance and tax credits. It left me in a terrible situation. I had four part-time jobs just to make ends meet and even then, very often, I was running out of money and not coping. Sonya couldn’t be happier with the design of the properties and the eco-features that will help her save even more money. She said: “We have solar panels that make our electricity cheaper and rain water is collected in a tank to help flush the downstairs toilet. Everything is insulated and the house is so warm and cosy. “It’s so modern and simple things like wider interior doors and low level worktops mean as you get older you’d still be able to live here even if you are in a wheelchair. I feel safe and I don’t need for anything else. Christian loves it here too as he’s much closer to his friends. Conwy County Borough Council’s Affordable Housing Development Officer David Lowe said: “We looked at the need for these new homes. Cartrefi Conwy owned the land and the properties were built partly through a Welsh Government funding grant approved by the council. “These really are excellent properties built to a high standard and are helping tenants such as Sonya Pritchard to downsize. The rules now mean people are penalised for over occupancy so it’s important to help people downsize whenever we can. Cartrefi Conwy’s Assistant Director of Properties, Adrian Johnson was pleased the scheme was delivered on time and within budget. He said: “I’m delighted we have been able to deliver these properties in a high demand area of Llandudno and it also demonstrates our commitment to growing our housing stock.